This photo was taken two weeks ago in my work parking lot. I had just pulled into the lot and I turned off the ignition and I was about to take my helmet off. 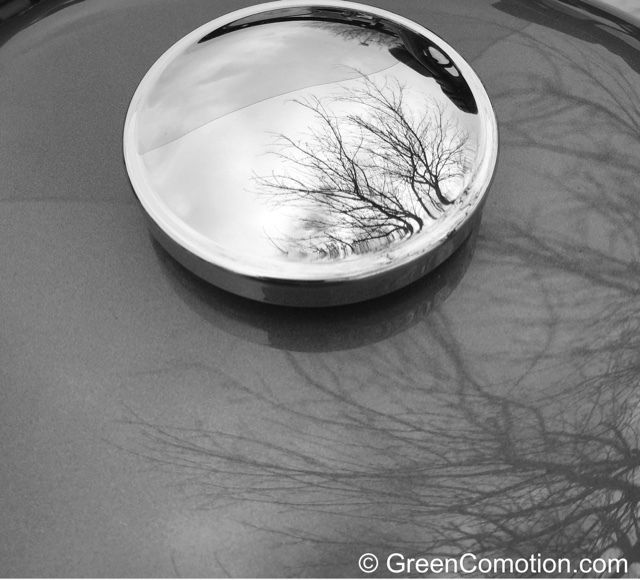 Then, I looked down and I saw this nice reflection of the sky and the tree branch on my fuel tank's lid. I have often heard that it is the journey and not the destination that matters. I would offer that one needs to incorporate 'presence' into this paradigm (?). Without 'presence', where would we be? What a wonderful image and the b&w suits it too. I like how the reflection is also repeated on the tank...you done good noticing this! I wonder how many great scenes we all pass by everyday without noticing. Hello, pretty reflection shot. I like the quote too! Happy weekend! Nice quote. Love the picture.